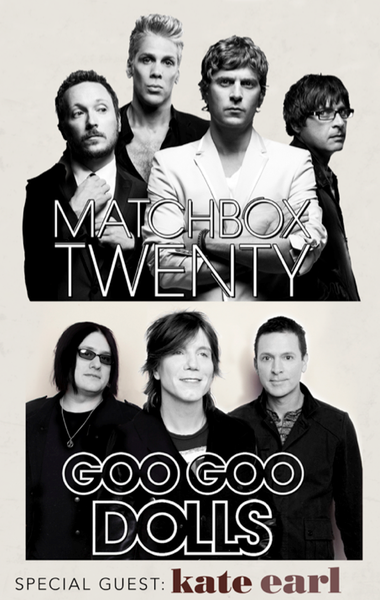 Two more dates on the recently announced Matchbox Twenty & Goo Goo Dolls Summer Tour will be included in a fanclub exclusive pre-sale on Tuesday April 2nd at 10am local venue time. For Hershey, PA, you will need a pre-sale code. The first batch of codes went out to all current fanclub members at 7am PT today (4/1). A second blast will go out to all new members at 7pm PT on 4/1, so make sure you are a member by then in order to get your code. Having trouble receiving emails from ground(ctrl)? Follow this helpful guide to make sure you get all the emails. As a side note, its always good to add [email protected] to your contact list in your email.